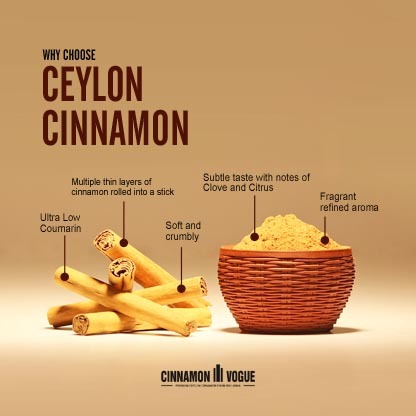 We show you why Ceylon Cinnamon from Sri Lanka is the safer, healthier and tastier Cinnamon. Originally native to the Island of Sri Lanka, 90% of the World's Ceylon Cinnamon still comes from there. Even in Sri Lanka, high quality Ceylon Cinnamon only grows in the South West corner of the Island due to some very unique soil and weather conditions. It is for this reason, as well as its unique properties that Ceylon Cinnamon is often called " True Cinnamon " or real Cinnamon. As diabetes reaches epidemic proportions many diabetics, rightly or wrongly are eating Ceylon Cinnamon. Ceylon Cinnamon has low Coumarin levels of 0.02% compared to 0.4 - 0.8% for Cassia type Cinnamon. Even at levels of 0.4 - 0.8% Coumarin is considered dangerous to your liver. Ceylon Cinnamon however can be consumed on a daily basis without undue concerns. Having said that, you should only consume moderate levels of even Ceylon Cinnamon. Too much of anything can cause toxicity in our body. The US national Health service claims you should not take more than 6g of Cinnamon per day for 6 weeks or less. That seems a reasonable precaution. Read about the dangers of Coumarin here. Shouldn't Cinnamon taste strong and flavorful you ask? Quite the contrary. A strong Cinnamon taste might work for a few overtly Cinnamon tasting recipes, but the vast majority of recipes would be better off with Ceylon Cinnamon. This is because Ceylon Cinnamon never takes center stage. Like salt, it is an ingredient that adds to the whole to create a more complex flavor. In fact you would be hard pressed to know that Cinnamon was used in many Asian curries or European baked recipes. But without Ceylon Cinnamon those recipes would be dull insipid affairs. Cassia Cinnamon by contrast is very spicy and often detracts from the main flavor of any recipe. In Sri Lanka, the home of Ceylon Cinnamon, it is added to many curries to create a savory taste. Mexican recipes which makes extensive use of Ceylon Cinnamon came from Spain which in turn discovered Ceylon Cinnamon nearly 400 years ago. That means many of these European Cinnamon recipes have had centuries to create multi layered flavors with subtle combinations of Cinnamon and other spices. Ceylon Cinnamon tends to be slightly sweeter with notes of citrus and clove. It has no sugar however. The slight sweet taste of Ceylon Cinnamon is an advantage if you, like many diabetics drink or eat cinnamon on a daily basis. For example when you make some te de canela with Ceylon Cinnamon you will find that it is surprisingly sweet. Without sugar. But the sweet taste has another advantage. It works very well with fine desserts. The blend of Ceylon Cinnamon creates a very sophisticated taste profile without the need for so much sugar. Ceylon Cinnamon has an amazing aroma. Try some Ceylon Cinnamon French Toast made with the Ceylon Cinnamon powder. You will suddenly realize how much better it is. The whole house will waft in a truly intoxicating scent. Or boil a Ceylon Cinnamon stick into tea. The aroma is particularly good in the Ceylon Cinnamon Bark Oil because it has the highest levels of Cinnamaldehyde, the compound that makes that characteristic Cinnamon smell. Ceylon Cinnamon sticks are rolled like a cigar with slivers of paper thin Cinnamon bark, It is very fragile and crumbly. 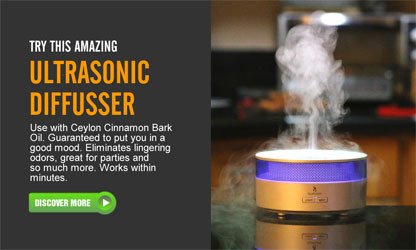 That means it is easier to grind into fresh Ceylon Cinnamon powder. Good chefs know fresh Cinnamon powder makes a huge difference to any recipe. Grinding the hard Cassia Cinnamon is likely to break your grinder. Try our Ceylon Cinnamon powder, which is cool ground into a fine 100 mesh powder to retain more of the natural oils in Cinnamon. Ever wonder why Cassia cinnamon oil is so cheap and Ceylon Cinnamon Oil is relatively expensive? This is because Ceylon Cinnamon Oil is much harder to extract. The Ceylon Cinnamon Bark Oil resides in the thin inner bark of the Ceylon Cinnamon tree. It has to be peeled very carefully and then steam distilled. There is only about 1% oil in this thin sliver of bark. But once you extract it you have one of the most exotic essential oils known to man. All you need is 1-3 drops either for aroma or to add to a drink. It is that powerful. Significantly free of contaminants especially Coumarin (see Cinnamon compounds list here) it has some very powerful health benefits that the FDA bans us from telling you about. No wonder it is the first and only choice for the World's best food manufactures like Coca Cola to the French perfume industry. Ceylon Cinnamon is made first by cutting a branch of the Cinnamon tree called Cinnamomum Zeylanicum. Once the branch is cut, it is washed and the outer bark is scraped very carefully with a special knife. Once this is done the Cinnamon peeler will rub a special stick against the bark until it starts to bleed water. This is when the soft inner bark is ready to be gently peeled. The idea is to peel one single long piece of bark. This is only possible if you get a straight branch with little or no knots. Once it is peeled, then smaller slivers of Cinnamon Bark are then packed into one long unbroken piece of Cinnamon Bark and left to dry naturally overnight. Once dried the Cinnamon becomes a light brown color. It is then cut to smaller lengths according to need. If there are two many smaller pieces, these are dried on their own without being rolled and then made into powder or used for steam distilling into Ceylon Cinnamon Bark Oil. Watch the video below to discover how they make Ceylon Cinnamon.